Your PopCulteer has returned from his annual trek to ToyLanta, and I will write extensively about that event tomorrow in The PopCulteer. But today, since I’ve been on the road for more than a week and this is my first post since returning, I’m going to tell you about the non-Toylanta parts of the trip leading up to the big show. I and my lovely wife, Mel Larch, left last Tuesday, heading West on I 64, then picking up I 75 South around Lexington. We could drive straight to Atlanta, but because we want to enjoy the trip, we usually stop somewhere in Tennessee for the night. I’ve not been able to travel until the last few years, and I’m really learning to enjoy the travelling part of the trip, instead of just getting to the destination. Specifically, I wanted to stop at some cool places along the way like the Peddler’s Mall in Winchester Kentucky, and Lee’s Fried Chicken in Morehead. 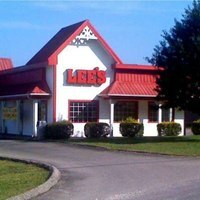 Back in the 1980s we had Lee’s Fried Chicken in the Charleston Town Center and in Saint Albans, and it’s still, far and away, the best fast-food fried chicken on the planet. I know there are people who worship at the altar of Chic-Fil-A, but Lee’s is easily a thousand times better. There’s actually a Peddler’s Mall near the Lee’s in Morehead, but the one in Winchester has much better stuff. Peddler’s Mall is basically a chain of antique malls that set up like a hermit crab in abandoned retail stores. I imagine they’ll make it to Charleston sooner or later. They’re a bit hit-or-miss, and the selection depends on what city they’re in. Winchester is also where the Ale 8 1 bottling plant is, and we stock up on Kentucky’s finest regional soft drink while we’re there because it costs about a third as much as it does at Cracker Barrel locally. On this trip we decided to stay at a Hampton Inn in Ootlewah, Tennessee, largely because it’s a fun name to say, and also because the rates were low. We’ve been travelling through Tennessee for a couple of years now, but there’s still so much to explore as we fly by the weird sights on the way to ToyLanta. 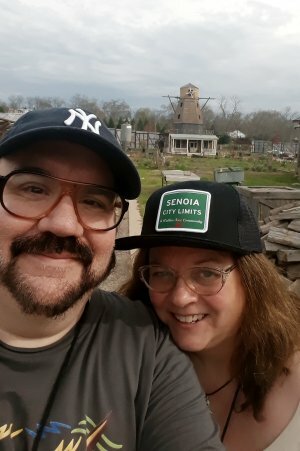 Someday we’ll find out the story about the decrepit and decaying amusement park right by the Interstate, or figure out why so many of the intimidating 90-foot tall crosses are right next to stores that sell “adult novelties.” This time, however, we were on a mission. 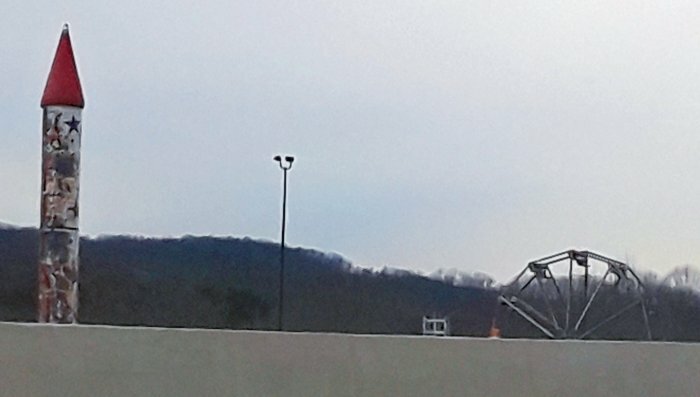 I never have my camera ready when we pass the decrepit amusement park going South, and this is about all you can see of it going North, on the other side of the Interstate. Wednesday we arrived at the Marriott Century Center hotel in Atlanta which was hosting ToyLanta for the last time this year. It’s a great hotel, but the show has outgrown the space, and to be honest, last year’s renovations made the stay a little less pleasant, as they got rid of the microwaves in every room, replaced the noise-deadening carpet with acoustically-transparent laminate, and replaced the spacious desk with a shallow ledge right in front of the television. They also replaced the desk chair with a wretchedly uncomfortable non-wheeled chair, but the hotel staff was able to trade that out for a comfy chair with wheels for your fidgety correspondent. Next year ToyLanta will relocate to a fancy Hilton in Marietta, Georgia, which is not only about half an hour North, and therefore closer for us, but also on the good side of the famous Atlanta traffic, so it’ll be a breeze to get there. I’m excited to see what the new place looks like, even though it will likely mean the end of of the parachute drop. 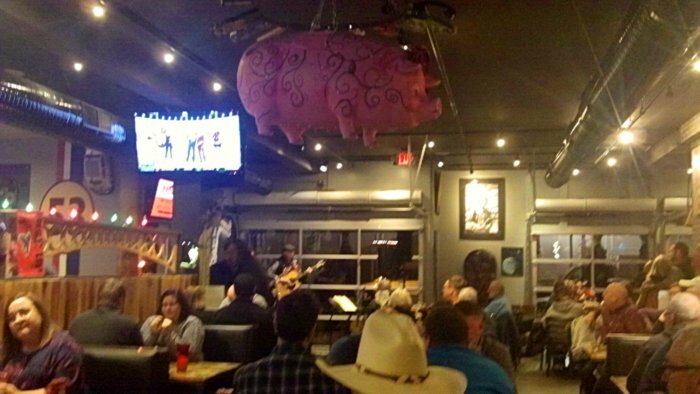 Anyway, we got checked in and this year decided to forego the annual giant hamburger challenge at Lucky’s on Wednesday night because, to be honest, We didn’t care much for the food the two previous times we went there, and last year the high chairs wrecked my back for the entire show. We had pizza delivered and hung out in the lobby as people returned from Lucky’s and confirmed that we had made the right decision. The wall at Alexandria. I’ll tell you about our trip inside the wall next week. Notice that they take the blades off the windmill when they’re not shooting. That’s a working windmill, and the high winds would rip it to shreds. 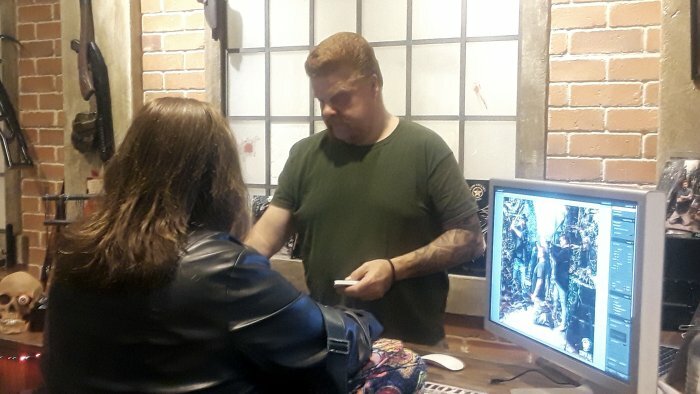 Mel, buying something from “German Abraham” in his gift shop below The Woodbury Shoppe. 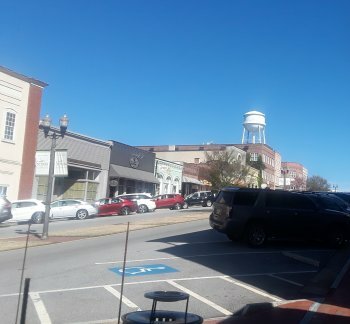 Not in Senoia, this is in nearby Harrelson, where we also took Jack. 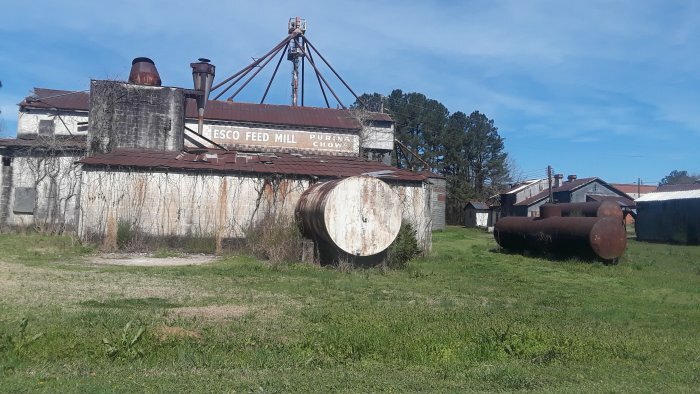 You may recognize the Esco Feed Mill from the opening credits of The Walking Dead for a few a few seasons early one. Here’s Jack with German Abraham. It was a blast having Jack come along for his first visit to Senoia, and we all had a great time. We got Jack back to the hotel by check-in time. The Walking Dead fun was not over for me and Mel, but we’ll have more on that later. 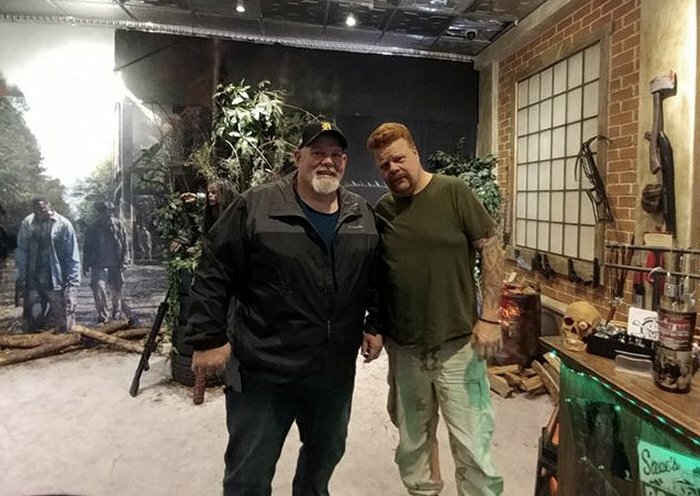 Mel and I would return to Senoia on Sunday for the new Walking Dead studio backlot tour. During our time in Senoia on Thursday, Jack shared photos of his top-secret project that took first place in the ToyLanta custom figure contest, and second-place in the custom vehicle contest. You’ll see those tomorrow. Thursday night the early arrivals all made their way to Hawg & Ale, a new restaurant co-owned by ToyLanta’s Buddy Finethy. We rode with Andy McGrady, who is a master at sculpting and customizing action figures. And even though your PopCulteer partakes of neither pork nor beer, we found stuff to eat on the menu that was fantastic. I believe that Buddy’s plan is eventually franchise this restaurant concept, and I can’t wait to see it take off. 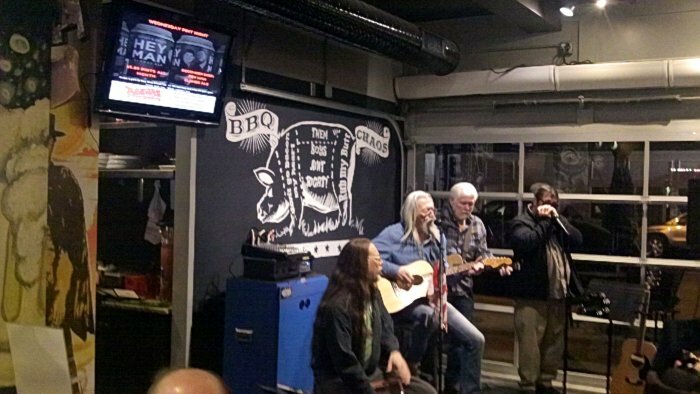 Nobody every went broke selling BBQ and beer, and Buddy knows more about designing a restaurant than you could possibly imagine. Friday was the start of ToyLanta, and I’ll tell you all about that tomorrow. 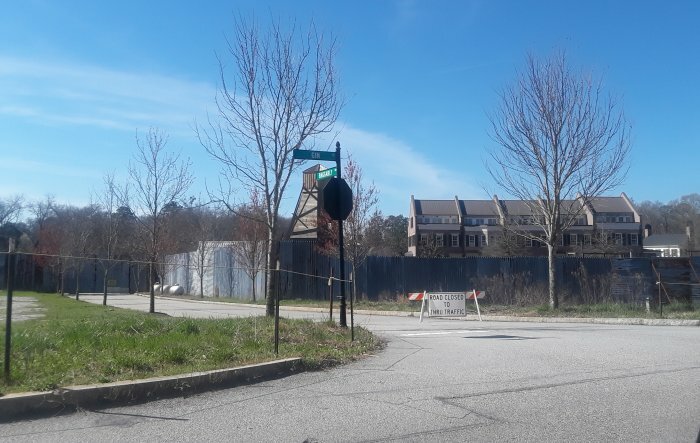 We actually cut out of ToyLanta early on Sunday to go on The Walking Dead studio backlot tour, and that is something I’ll write about next week. But the photo at the head of this post is your PopCulteer and his wife INSIDE the wall at Alexendria, a set that is located in Senoia. Right now, I have to schedule the rest of the week on The AIR, which will remain in reruns until next week. What a ride! I would need back surgery after all that time in the saddle.